On August 4, 2017, AquaBounty Inc., an American company whose production facility is at Bay Fortune, PEI, released its quarterly financial results. The report revealed that the company had sold 4.5 tonnes of genetically modified salmon in Canada, marking the world’s first sale of GM fish for human consumption. The fish has been sold without sufficient product labelling for consumers to make an informed purchase. Canadians are the first humans in the world to consume a GM animal, and don’t even know about it. The Ecology Action Centre has been working to oppose AquaBounty’s production of GM salmon in PEI since 2013 because of the threat it poses to wild Atlantic salmon. We’ve had some major successes in recent weeks, including confirmation from Federal Environment Minister Catherine McKenna that if AquaBounty Technologies plans to grow their AquAdvantage salmon at Rollo Bay, PEI, (a new location, different from their approved site at Bay Fortune) they will be subject to strict requirements. Now, we need public support to help tell grocery stores, Ministers, and the Premier of Prince Edward Island that Canadians don’t support GM salmon. 1. Tell your grocery store! Email, phone, or tweet your local grocery store and ask them to sign the SeaChoice retailer pledge or to commit to have it clearly labelled as GM if they do intend to sell it in their stores. 2. Tell everyone! Every time you share the news about our campaign you are helping us to spread the word and reach new supporters. 3. Send an action letter to the Minister of Environment here. 4. Send an action letter to the Minister of Health here. In late November 2013, the Government of Canada approved the manufacture and export of genetically modified salmon eggs by AquaBounty, Inc. at their production facility at Bay Fortune, PEI. 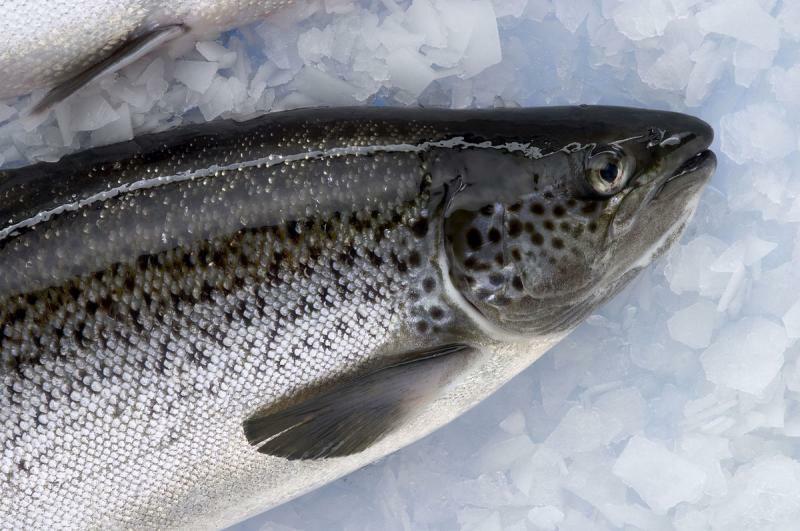 This salmon, which the company claims grows faster than wild Atlantic salmon, is the world’s first genetically modified food animal on the market for people to eat. The modified salmon contain genetic material from two other species, ocean pout, an eel-like fish, and Chinook salmon. 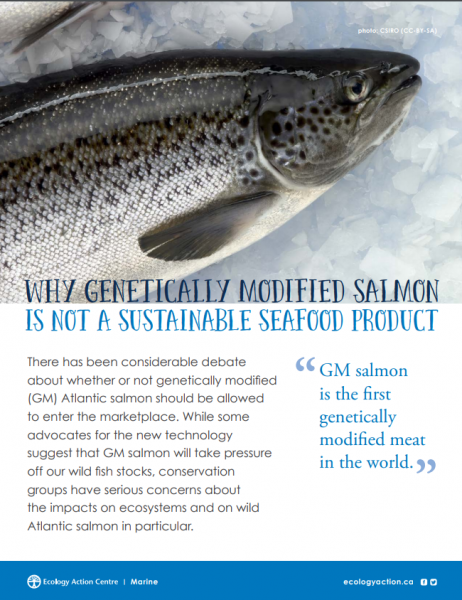 Here at Ecology Action Centre and Living Oceans Society, we believe that the approval for manufacture of this GM salmon is unlawful under the Canadian Environmental Protection Act (CEPA). 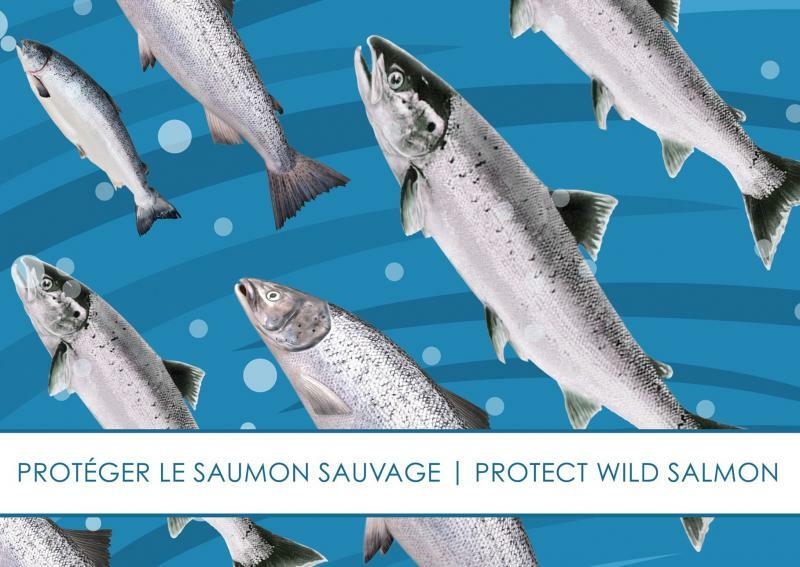 We say the Canadian government failed to properly assess the risks, particularly to wild Atlantic salmon, if this new fish were to escape into the wild. Government scientists have acknowledged that these fish could breed with wild salmon. Canada’s federal government has shrouded almost every aspect of its dealings around GM salmon in a cloud of secrecy, denying any public scrutiny of its processes. The law regulating GM Animals in Canada has not kept up with the technology, and provides almost no opportunity for public or stakeholder input. Living Oceans and Ecology Action set out to shed light on how a genetically modified animal could reach approval for commercial production without one ounce of public input. 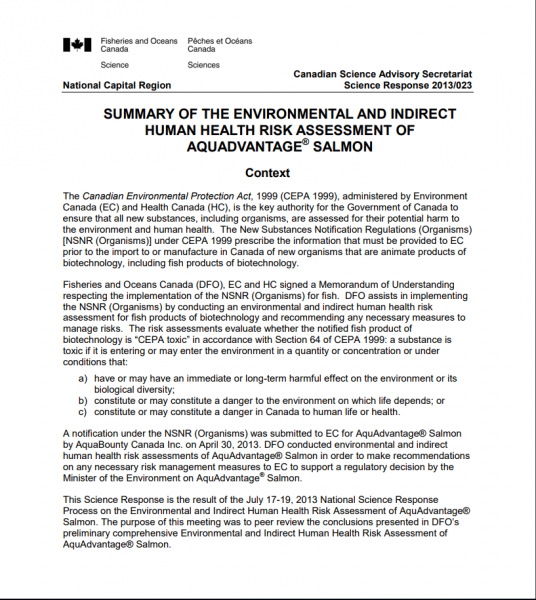 Alternatively, the Minister of the Environment failed in her legal duties by permitting unassessed uses of AquAdvantage salmon, such as its grow out in Canada, to proceed. The case came before the Federal Court on November 17, 2015 and the judge released his ruling in December of that year. He ruled against EAC and LOS but did agree that the law prohibits the federal government from allowing AquaBounty to use this genetically-modified organism at locations other than at its assessed facility in P.E.I. putting his ruling in conflict with an approval previously issued by Environment Canada. The groups felt that the judge’s decision left too many questions unanswered including the conflict between the ruling and Environment Canada’s approval. As such, EAC and LOS appealed the decision, once again represented by Ecojustice. In October 2016, the judge once again ruled against EAC and LOS. Given the global impact, and the significance this decision will have on biodiversity, the court challenge and subsequent appeal was a rare but important action for the EAC. While our court challenge was unsuccessful, the law generated by the two court cases is proving useful in challenging AquaBounty’s plans to move to commercial production in PEI. In response to two letters sent to the Federal Minister of Environment and the Federal Minister of Heath, we received confirmation that the AquaBounty plans will be subject to an environmental assessment. Federal Environment Minister Catherine McKenna confirmed that if AquaBounty Technologies plans to grow their AquAdvantage salmon at Rollo Bay, PEI, (a new location, different from their approved site at Bay Fortune) they will be subject to environmental assessment. In her letter, McKenna said, “Should AquaBounty wish to manufacture or grow out the AquAdvantage salmon at this site, a new notification will be required pursuant to the Canadian Environmental Protection Act, 1999." We also helped expose significant problems with the Canadian Environmental Protection Act (CEPA), both in transparency and the risk assessment process. MP’s cited our concerns in their recent recommendation that current CEPA rules around the introduction of new GM foods be amended. If approved, these recommendations will open up the process for approval of GM organisms, requiring public notification of applications for new substances or living organisms and providing opportunities for public input throughout the process. Our work has helped educate and inform Canadians actions, and has also helped garner public support. Our petition opposing GM salmon for the sake of our oceans and our wild salmon populations garnered more than 52,000 signatures. Our opposition resulted in significant media coverage, helping build awareness about risks posed by GM technology to biodiversity. The EAC has joined a court case against the US government for its approval of GM salmon for human consumption. Interestingly, the US approval only approves production at the PEI facility; there is no approval for production in the US. The US court case involves commercial fishing groups, First Nations, recreational fishing groups, environmental groups and consumer organizations. As gene editing tools such as CRISPER become easier and cheaper, regulatory regimes that can regulate new and emerging technology and environmental science are crucial in protecting biodiversity and public health. There has been no consultation with Canadians on GM salmon—none. We call on the Federal Government and the Government of Prince Edward Island to halt any further sales of GM salmon, accelerate the assessment of commercial production in Canada, stop providing funding to AquaBounty, and implement the requested changes to CEPA as soon as possible. Be sure to also visit our partners and allies at Living Oceans Society, the Canadian Biotechnology Action Network, Friends of the Earth and the Center for Food Safety.